The next posts from pages to be targeted in Facebook’s ongoing efforts to maintain the quality of its News Feed will be: posts actively seeking likes, comments, or shares; photos and videos that are repeatedly shared; and deceptive, spammy links. The vast majority of publishers on Facebook are not posting feed spam, so they should not be negatively impacted by these changes, and, if anything, they may see a very small increase in News Feed distribution. 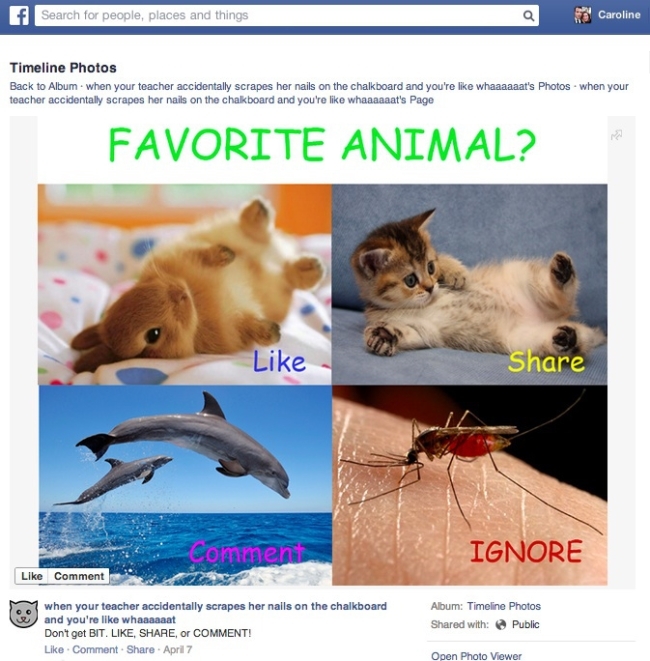 Like-baiting: “Like-baiting” is when a post explicitly asks News Feed readers to like, comment, or share the post in order to get additional distribution beyond what the post would normally receive. People often respond to posts asking them to take an action, and this means that these posts get shown to more people, and get shown higher up in News Feed. However, when we survey people and ask them to rate the quality of these stories, they report that like-baiting stories are, on average, 15 percent less relevant than other stories with a comparable number of likes, comments, and shares. Over time, these stories lead to a less enjoyable experience of Facebook, since they drown out content from friends and pages that people really care about. The improvement we are making today better detects these stories and helps ensure that they are not shown more prominently in News Feed than more relevant stories from friends and other pages. This update will not impact pages that are genuinely trying to encourage discussion among their fans, and focuses initially on pages that frequently post explicitly asking for likes, comments, and shares. Frequently circulated content: People and pages on Facebook frequently reshare great content, but people tell us there are occasionally instances where photos or videos are uploaded to Facebook over and over again. We’ve found that people tend to find these instances of repeated content less relevant, and are more likely to complain about the pages that frequently post them. We are improving News Feed to de-emphasize these pages, and our early testing shows that this change causes people to hide 10 percent fewer stories from pages overall. Spammy links: Some stories in News Feed use inaccurate language or formatting to try and trick people into clicking through to a website that contains only ads or a combination of frequently circulated content and ads. For instance, these stories often claim to link to a photo album, but instead take the viewer to a website with just ads. By measuring how frequently people on Facebook who visit a link choose to like the original post or share that post with their friends, we’ve been able to better detect spammy links. The update we are making today improves News Feed to reduce cases of these spammy links, and in our early testing, we’ve seen a 5 percent increase in people on Facebook clicking on links that take them off of Facebook — this is a big increase in the context of News Feed and is a good sign that people are finding the remaining content in their News Feed more relevant and trustworthy. Focus on posting content that is relevant and interesting to your target audiences. It’s OK to encourage discussion about your posts’ content, but you should avoid asking for likes or shares to get more distribution. Develop a publishing strategy that uses original content and is not copied from other sources. Marketers who are linking to their own legitimate websites will not be affected by this update. Readers: What do you think of the newest round of changes to News Feed?